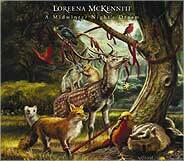 Marrakesh Night Market		6:25	"Marrakesh"
The Dark Night Of The Soul	6:43	"St. John"
Bonny Portmore			4:24	Loreena says she discovered the story of the tree 14 years ago !!!!! 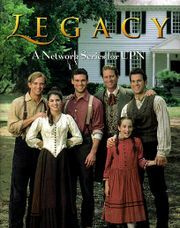 This is an excellent DVD. They manage to show the "right" footage almost the entire time. there is footage of both drummer Tal Bergman and percussionist Rick Lazar. The guitar/violin duel at the end of 'Bonny Swans' is also catched very well on the DVD. 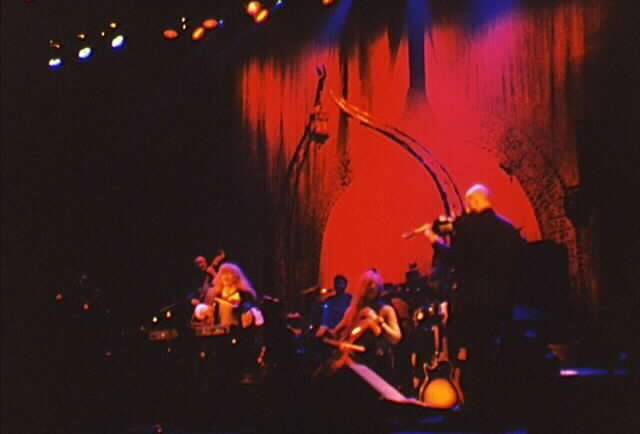 manage to get a bad shot since the piano is somewhat blocking Loreena. There is so many other live DVD's where you get so annoyed that they keep showing "wrong"
shots the whole time. For instance showing the vocalist during a guitarsolo. visible, but since I know what is missing it is still a bit sad. 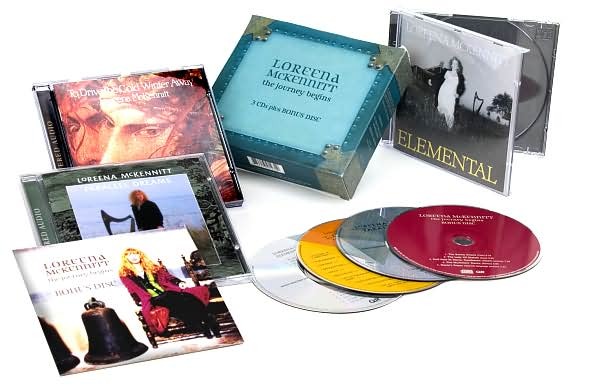 For some reason, they have taken away even more (almost all) of Loreena's words on the 2CD version. which is a shame since they don't even use that intro/lighting on the 'An Ancient Muse Tour'. 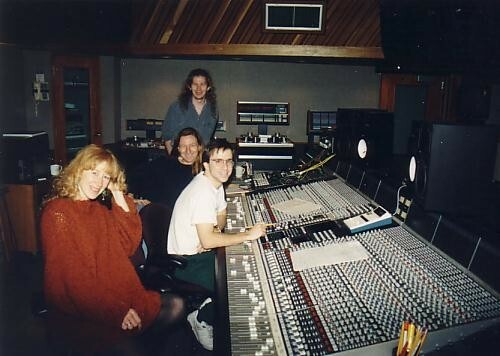 Christmas with Loreena KCRW Studios Dec./1994 Live in the Studio Santa Monica, CA. 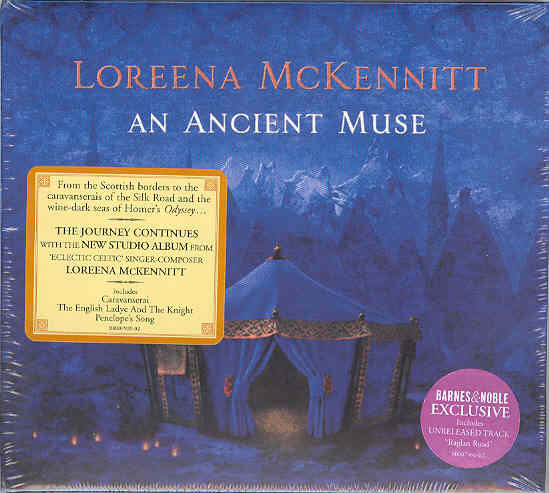 No Journey's End weaves together the artist's own words and music, with an audio soundtrack that includes excerpts from the songs "The Mystic's Dream", "Bonny Portmore", "Prospero's Speech", "Huron 'Beltane' Fire Dance" and "Tango To Evora". 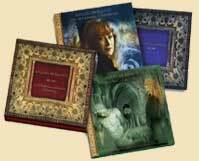 Also features a live concert performance of "The Lady Of Shalott" and performances of "Santiago" and "The Dark Night Of The Soul". No Journey's End is available from Quinlan Road as a VHS videocassette and as a DVD. 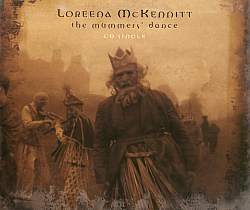 The DVD offers additional content including the full versions of the music videos "The Bonny Swans" and "The Mummers' Dance" in stereo and 5.1 surround mixes. 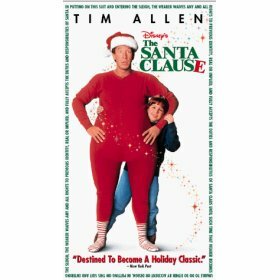 It is also featured on the soundtrack, then in a 7 minute version. to Stratford. I met her at her office in Stratford and stayed the night at some of her friends. 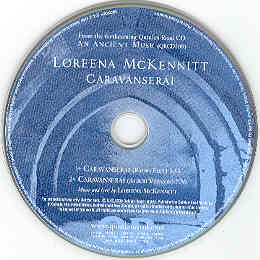 Then on the day of the show (sunday), I actually went with Loreena in her car another couple of hours south to London. 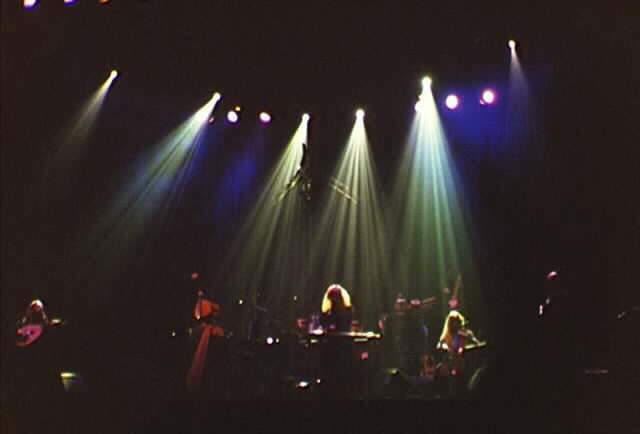 I was planning to go up to Quebec to see Jethro Tull after this but Loreena was so good, I decided to see one more show. 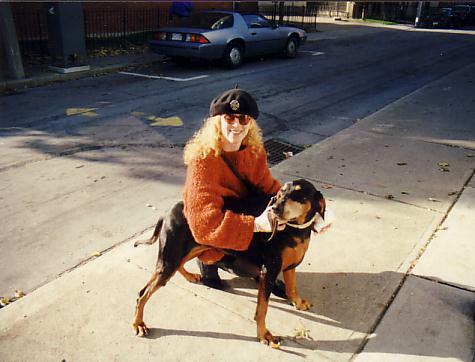 After having breakfast with Loreena at her hotel, I took the bus to Windsor at the border to USA. Stayed there a couple of hours before going over the border to Detroit and then on to the suburb of Ann Arbor. The Ark is actually a small place but well known in the neighborhood as a very nice venue and it was. 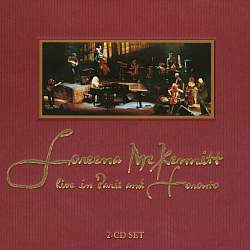 Great show, I sat in the center, just a few feet away from Loreena. This was a breakfast show mostly for journalists in the wonderful acoustics of the breakfast room at Strand Hotel. 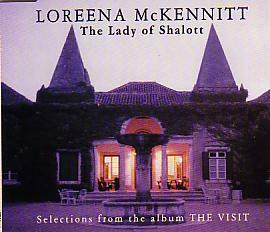 Later that wednesday Loreena filmed a performance of The Lady Of Shalott for Söndagsöppet on swedish TV. First encore: 10:44 p.m. - 10:50 p.m.
Second encore: 10:52 p.m. - 10:57 p.m.
Third encore: 10:59 p.m. - 11:05 p.m.
First encore: 11:12 p.m. - 11:18 p.m.
Second encore: 11:21 p.m. - 11:26 p.m.
Third encore: 11:28 p.m. - 11:32 p.m. In between all my planning for my birthday party, I took the train down to Lund for this show. Came down just one hour before the show and went back to Stockholm again on the nighttrain after the show. 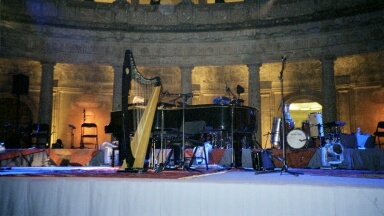 Although this was my shortest trip so far, for a full-length Loreena show. First encore: 10:12 p.m. - 10:17 p.m.
Second encore: 10:19 p.m. - 10:27 p.m. 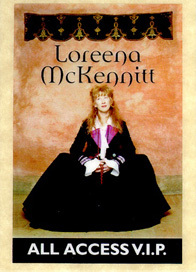 This was my 30th birthday and having Loreena in town for that was wonderful. Brian Hughes even played Happy Birthday on his guitar during soundcheck. During the afternoon I served the whole band some cake from Raivi in Hoting, upstairs at Gino. In between all the interviews, Loreena even had the time to get me some flowers for my birthday, and I still got them. The show was wonderful sitting way up in front very close to the stage. Loreena had arranged a couple of tables for me, my parents and friends. Sadly I never wrote down the tracklist but she ended with Annachie Gordon, just as I had wished for. She had been practising Annachie Gordon since Spain just for these two swedish shows. 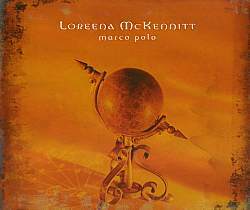 This was my 8th Loreena show and actually the 5th country in which I had seen her. Encore: 10:19 p.m. - 10:26 p.m.
For this tour I had taken one week off from work, to travel around and see a couple of shows. 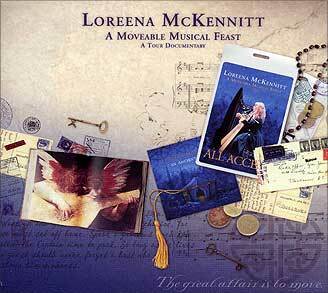 A very good choice as it seems possible that it might have been Loreena's last tour, although I hope not. 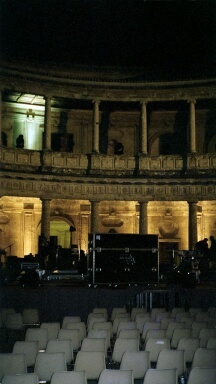 Although the tour started with a glitch as the power went out after a few minutes of the first show in Rome. After a delay of about 30 minutes the show started again, and although the show was good, it was going to get better. 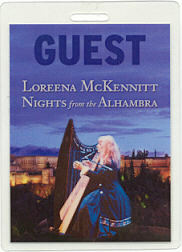 After the show I went to Loreena's hotel for a nightcap and a farewell, which was a nice end to a wonderful week. 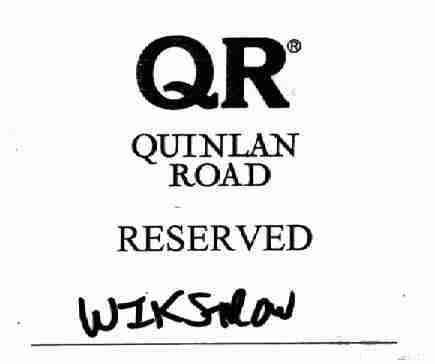 As Toronto and Stratford is not far away I managed to sneak in a two day stopover in Stratford to visit Quinlan Road. 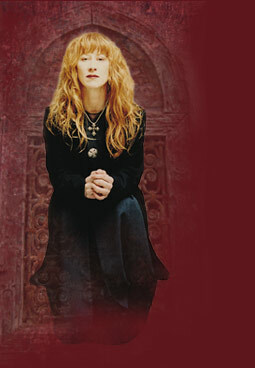 It was very nice to meet Loreena and all of her partners in the office even though she did not have any concert. They were working very hard with preparation for the double live CD that was going to be finished very soon. 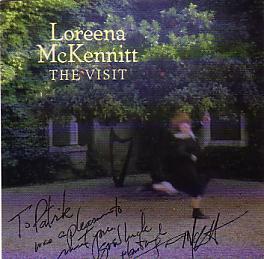 On Aug 9, I got an email from Loreena saying she was doing three live concerts in Spain. I almost couldn´t believe it. 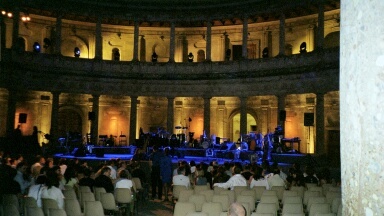 These concerts were later made official on Aug 22.
to the Alhambra and the Palace of Charles V (the fifth) at 8 o'clock. 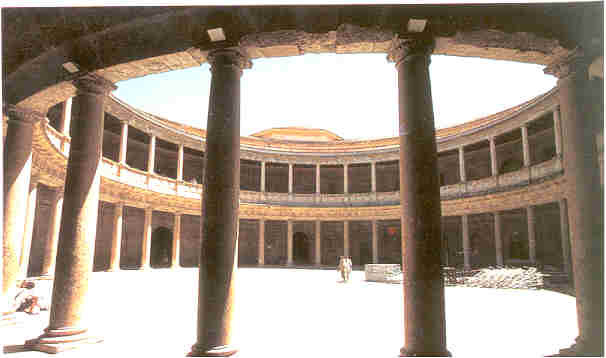 The Palace was designed in 1527 by Pedro de Mechuca, a pupil of Michelangelo. 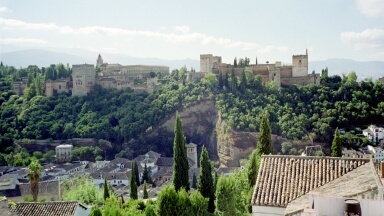 Alhambra has become the most popular tourist destination in Spain. The name means Red Fortress and it contains of several interlinked complexes. 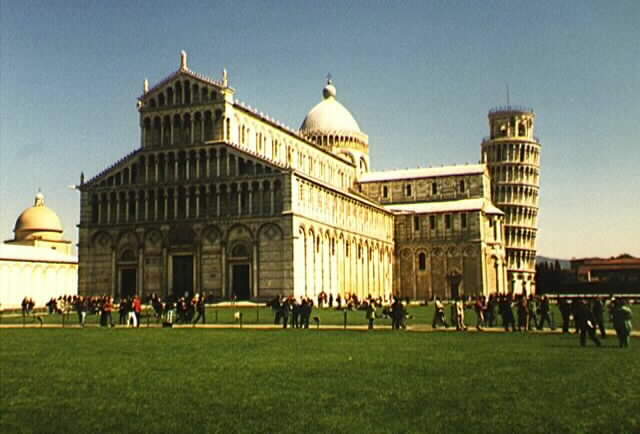 monastery for 46 years (from 1509 to her death in 1555) and declared her mad. 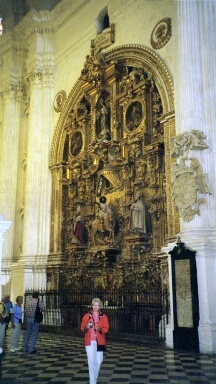 Carlos and his son Felipe II started the Inquisition. Before the show I talked a little to Hugh Marsh (fiddle) and Rick Lazar (percussion). 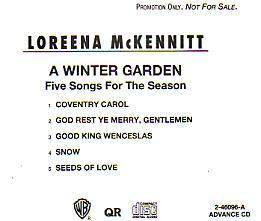 I also met Loreena for a short while, she was busy as always. 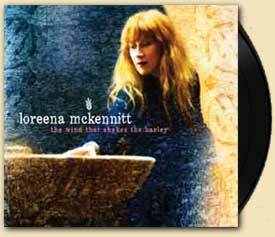 Loreena now has a twelve-piece band, not just eight as she had in 1998. 6 of them are the same. The bassplayer is new and there isn't any second guitarist now. Then there is a drummer now as well beside the percussionist. She also has a pipe-player, actually he is doing some additional percussion as well. he has been producing albums there. He has done five albums in Greece now. This means that Brian can focus more on his guitars, but he still plays a little oud as well. lighting and things. And it was not allowed to take any photos during the show. 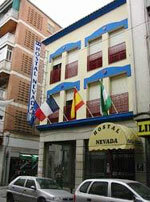 They had rehearsed at Real World for 10 days and then a few more days when they got to Spain. They had also filmed the dress rehearsal the day before, Sep 12, just in case. 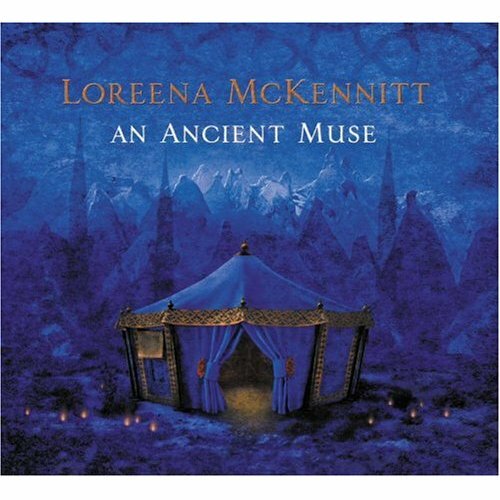 I had gotten a reserved seat just in front of Loreena in the front row. I could´ve sworn she looked straight at me, but I guess I´m imagining it. 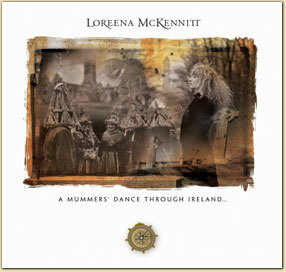 Before the show I also met a nice Irishman and his wife that had come down to see Loreena. Highlights: I don´t know where to start, there was so many. was superb. Brian told me afterwards "I thought you would like that". guitar/fiddle duel at the end was excellent. 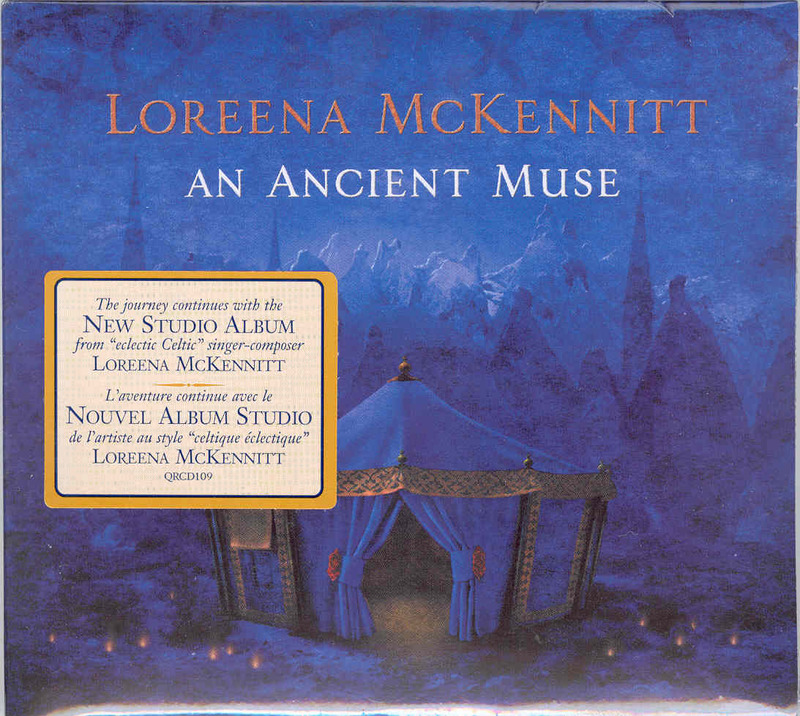 Loreena added "We do have fun". 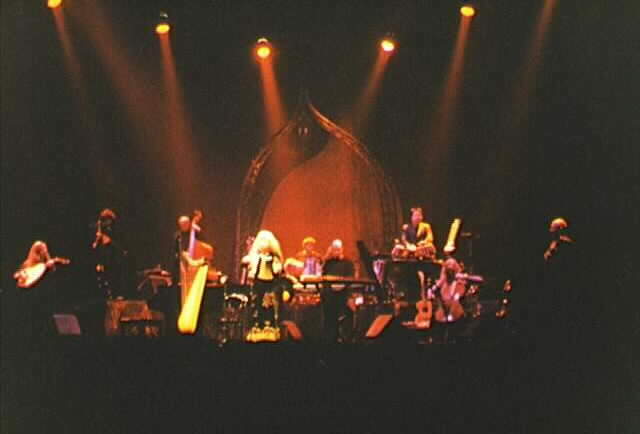 Another comment, the lighting during The Bonny Swans was the greatest of the whole concert. Otherwise the main highlight was the three new songs. I heard Caravanserai for the first time already during sound check. 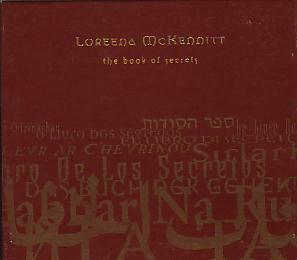 she did on The Book of Secrets so I already like the new album better. Of the new songs Penelope´s Song is my favorite after the first listening. 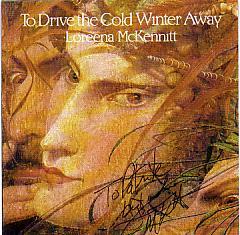 It's a wonderful slow song with magnificent vocals from Loreena. 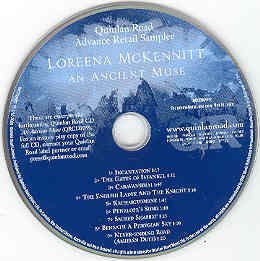 For Never-ending Road (Amhrán Duit), Loreena mentioned that "It´s new now". 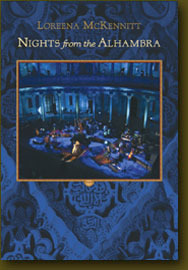 but of course it will be on the Nights from the Alhambra DVD. 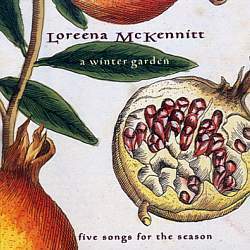 It's a slow wonderful song for just Loreena, Brian and Caroline. 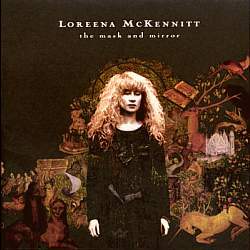 Great vocals from Loreena. 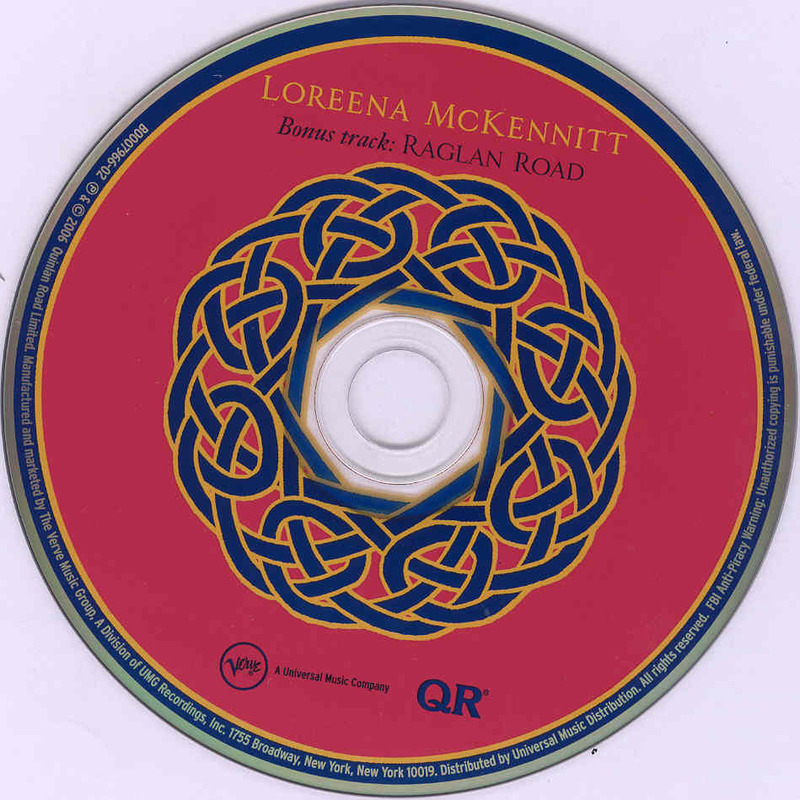 Raglan Road is a road in Dublin close to the Abbey Theatre where Loreena worked in 1988.
a rented bicycle on her way back and forth between the theatre and her bed & breakfast. a train ride through Siberia in 1995), Bonny Portmore, The Old Ways and Cymbeline. 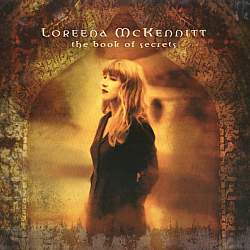 Loreena actually sings better than ever. 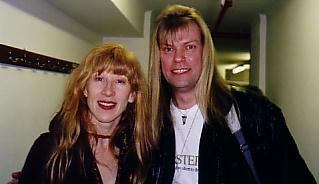 After the show I met Loreena some more. None of us thought it felt like eight years since we met. 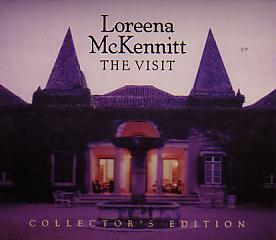 When walking down to the city I met some swedes that had traveled to Spain to see Loreena for the first time. Later on I also met her band members at the terrace bar at their hotel. Great view from there. It was hard recognising Nigel since he had cut his hair short. At 2.45 I left to go to my hotel, just a 4-minute walk. I had then been up for 24 hours. The second day I did some more sight seeing, The Cathedral among other things. I also checked out all the record stores but no sight of Loreena on vinyl. At 9 pm I took the bus up to the Palace of Charles the fifth. At the venue I noticed that I had the same seat reserved for me. As I came in a little later this evening I only spoke with Donald Quan. He also remembered me from Italy in 1998. This evening ran more smoothly (in the beginning) so the film crew didn´t have to stop as many times. Even Loreena came in before the show and talked for 3 minutes and explained about the film crew and things. Most songs were even better than the day before, even though it´s hard to imagine. with beautiful lighting coming from behind. It was a good choice to hand over the keyboard part to Donald. All Souls Night is also better than ever, Tal's drum sound really lifts the whole song. that the only thing that I thought was missing in her show was a real "show-stopper". She has really worked on that since then. 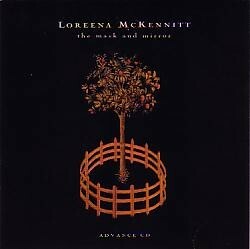 Every album has had at least one, The Mask and Mirror had two. Now it's even hard to choose between them. and fiddle. Then Don & Tim comes in and the song builds up. This might even become one of my favorites. The last line is: "Dreams that we had in the palm of our hands"
Then Hugh comes in on fiddle and then Panos closes the song on his greek instrument, (cano ?). A slight slip on the harp forced them to start again with Huron 'Beltane' Fire Dance. Before the second take she took the time to present her 12-piece band. She didn't use the same name "The Idling Porsches" as she did the day before. thankful for that since they all have their own bands and projects. 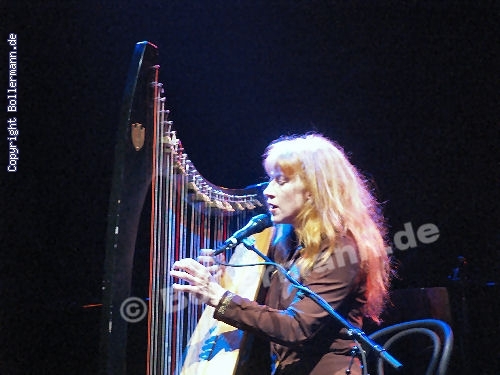 For Cymbeline Loreena had another harp that I don't think I've seen before. scratches, so I can tell them apart. 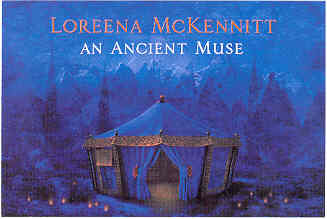 Loreena is usually forced to tune it before Cymbeline, so now she didn´t need to. 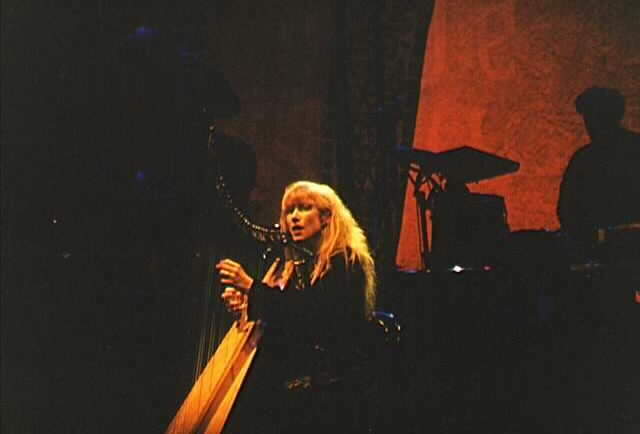 It's great that she has Trevor, the harp-tech, so she doesn't have to tune between songs. second encore one more time to have an alternative in the final mix. 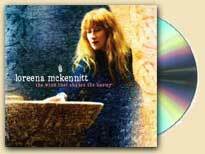 The second time Loreena said "You can sing along"
After Cymbeline Loreena came on stage one more time, just to thank the audience. Hugh mentioned for me after the show that there might even be a tour next year. Maybe starting in March and working its way up until the summer in Europe and USA. Hugh might not follow that tour though since he is busy working with film scores. He has already worked on Shrek, Shrek 2 and The Da Vinci Code to name a few. 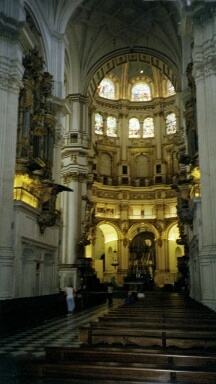 Friday Sep 15, was a day of feast in the city of Granada, so many places were closed. On the flight back home to Sweden the morning after I read my horoscope for the 15th. "This seems to be a day when things won't turn out the way you would like them to." 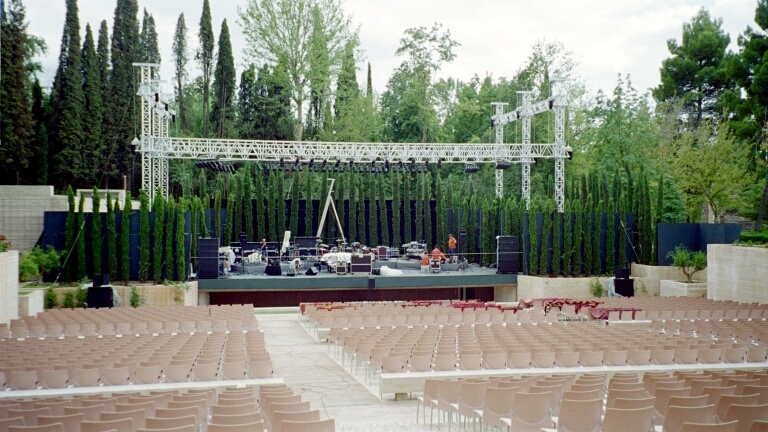 The third concert was played in the larger 1700 seat venue Teatro del Generalife. 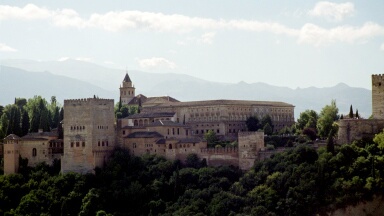 The Palacio del Generalife used to be the Sultan's summer residence. Soundcheck started at 20.30. They went through all the songs, but some for only a few seconds. Rick said that there had been talk about throwing in Tango To Evora this evening, but they never did. 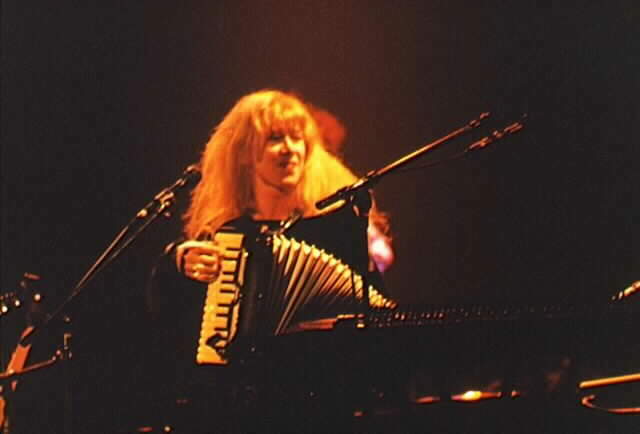 Loreena was disturbed for a while by a slight hum that she named: "The Al-hum-bra". done a misprint on the ticket so people were thinking they were 1 hour and 20 minutes late. but it became a little warmer (and no rain) two hours later when the show started. Strange how late they start concerts in Spain. At 23.11 they turned out the lights and even the people that got mad was happy again. What can I say, the third night was even better. 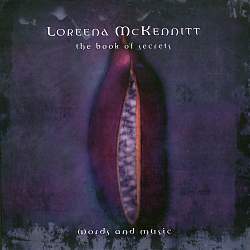 Loreena said that she wasn't going to speak as much, but she can't really help herself. Almost like Ian Anderson in Jethro Tull, but she isn't teasing the band members as Ian does. and the filming for TV. All done in the least possible number of days. She actually warned the audience and said: "I'm hoping my voice will hold out through the night"
third night she was spot-on and perfect all through the show. So powerful. all these last 15 days or so (some days for hours on end) and not a flaw, not a single one. Well I don't know where to start, so I guess I'll just go through the entire set-list one more time. made me shiver. And it wasn't because of the weather, it was just by sheer excitement. The transition to She Moved Through The Fair was done without words which makes it more powerful. and added: "They're lovely as long as it doesn't rain." Then the show went into The Mummer's Dance and the first new piece, Penelope's Song. This was my favorite new song during the first show but now I can't decide which song is best. played back-to-back this time, without talk, and that made the atmosphere much fuller. Then Caravanserai starts off with oud, cano, harp and fiddle. After a while percussion comes in! 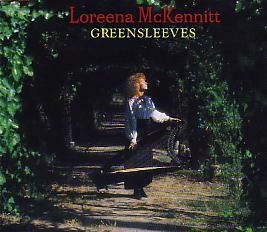 Then Loreena moves over to piano, raises her voice, then hurdy-gurdy and drums. Very powerful. I can now decide which new song is best, Caravanserai is best. This night they did Bonny Portmore, Santiago, Raglan Road and All Souls Night without talk between songs. travels and song writing, the mood is brought to a higher level when it's not disrupted by words. The transition between Santiago and Raglan Road for instance was just magical. 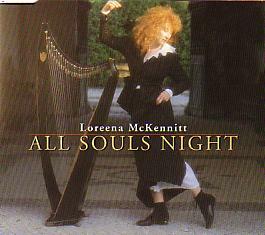 In All Souls Night I heard a small change in the way Loreena sings one of the words. of lowering as she used to do. And she sang it the same way on all three shows. I don't know if anyone else noticed that but I thought it sounded very nice. It actually made a difference. For The Lady Of Shalott she got a big round of applause from the audience just by starting the song. 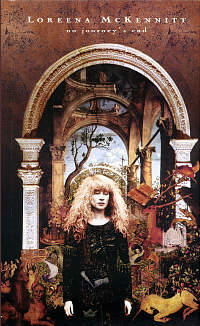 her first concerts in Spain in January of 1992. After a stunning rendition of The Old Ways it was time for the amazing new show-stopper Never-ending Road. Spain, An Ancient Muse will be her best album yet. "There's much more to bind us, than to tear us apart." a bit crowded where I was, on fifth row (aisle seat), so I had to move up to the front as well. that happen these last two songs either. Leaving the last words to Shakespeare is nice but I would have liked to hear Prospero's Speech instead. But you can't complain, shame on me. 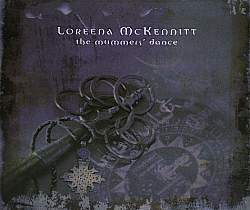 hug and goodbye with Loreena, Caroline and a handshake with Loreena's assistant Mark McCauley. On the way out I was followed by Karen Shook from Quinlan Road. She even thanked me for coming. sound that I want to hear in the future, and it will be possible, thanks to the live DVD. expected. But I do want to hear some of the tracks from To Drive the Cold Winter Away, on a live stage again. 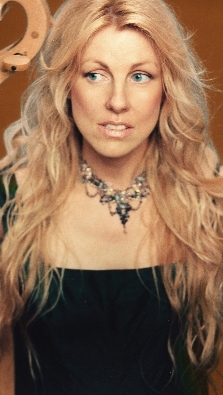 And I would like to hear one of my favorite songs Annachie Gordon (from Parallel Dreams) again as well. Since I couldn't take any good band photos I thought I'd borrow two from the two ladies' websites. The Old Ways he absolutely rules both the beginning and the end. I also love Rick's ending of Santiago. evening. 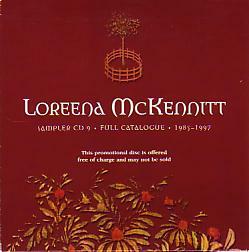 Bonny Portmore is another song in which Caroline takes some of the spotlight away from Loreena. the harp is 20 blocks away and the pipes are in my head." Also in Brian Hughes Band, have made a great change to the band's sound. It's heavier, tougher. the drums more on friday in the larger venue to create the same impact, but it was still great. Had a show in Greece two days later. 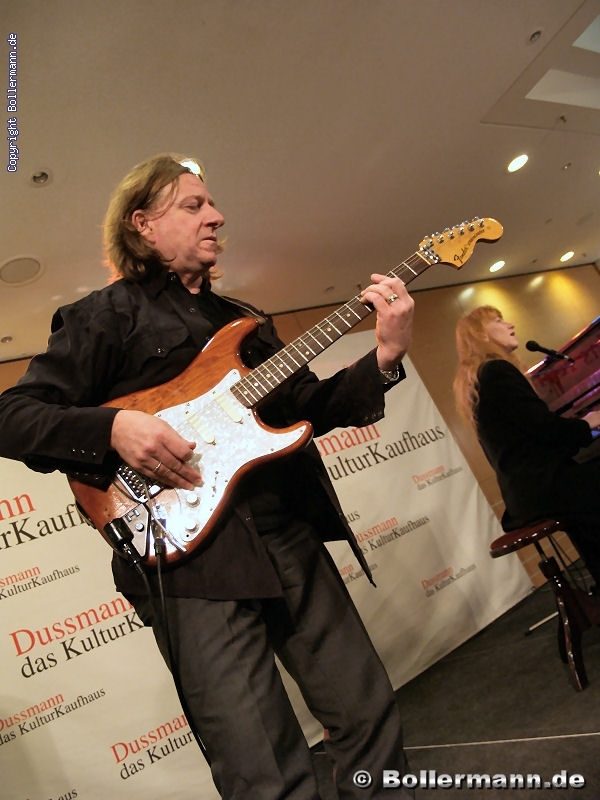 Was in Falun with his own band for the folkmusic festival in 2003 (give or take a year). wasn't until I got home I realized I met him at McClear Pathé in Toronto while mixing The Mask And Mirror. when I even stayed at his house in Toronto. He invited me to stay at his house if I came to Toronto again. I also talked to a guy called Santiago at the tourist office on thursday. He was playing a Loreena CD. concert to see the show. Then on friday he had a ticket and was sitting close to me at the venue. He came up to me and asked if there was a chance to meet Loreena after the show to get his ticket signed. I said there wouldn't be a chance of that since there was so much people and everyone was leaving the day after. Later he came up to me and gave me a pin, the city of Granada pin. and got it signed for him. 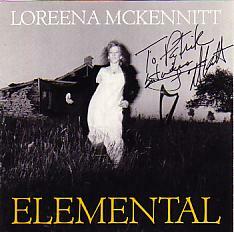 Then he even wanted me to give Loreena a framed picture from him, so I did. At the airport the day after, I met Sokratis again. He was on the same flight, three rows behind me. 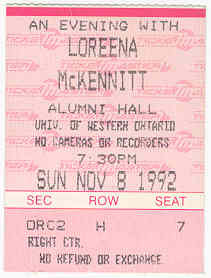 Actually he had seen Loreena in concert in Greece back in 1996, since his ex-girlfriend wanted to go. He liked it but never imagined he would be playing with her. 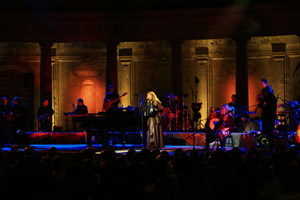 On March 12, 2007 the European Part of the An Ancient Muse Tour started in Frankfurt, Germany. 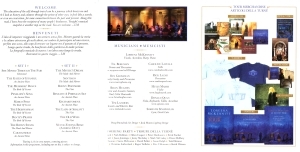 It consisted of 20 performances of which I only saw the 16th in Copenhagen, Denmark, April 1st. The changes in the set-list were less than expected from the shows in Spain in September. and only Stolen Child and Bonny Portmore taken out. But, it didn't really matter, it was magic anyway. In some shows they played a slightly different setlist though and with three encores. from Berlin February 10 and Dusseldorf March 27. Candlemass (the evening before), so we had a hard time since we didn't get much sleep. the soundcheck and thought that everything was looking good for tonights show. In the lobby I was approached by fello OWL Jan, who introduced me to his girlfriend and we chatted for a while. As always the show was great. Although it is nice to hear that even the sun has spots. 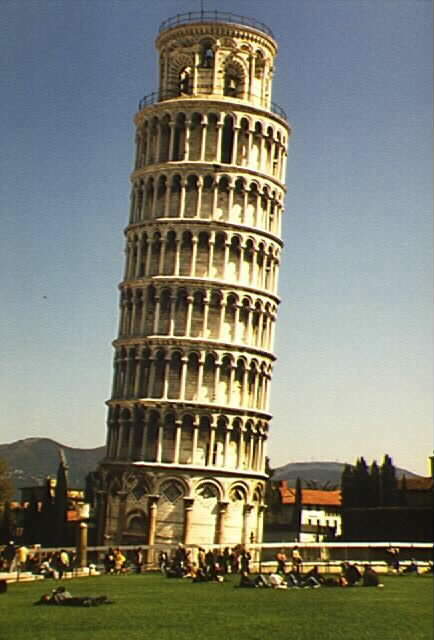 that's how well Loreena managed to "hide" the mistake. 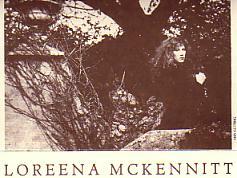 Loreena also got something in her throat during the opening of 'The Old Ways' but no apparent harm done. 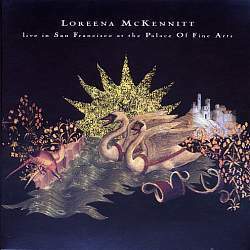 see the point in that since Donald can play the keyboard part so that Loreena just can focus on the vocals. I didn't mind Raglan Road but it would have been better to have that later in the set. Tal's drumsound was magnificent, and it really lifted 'The Gates Of Instanbul'. And since we're on the subject of her band members I must say that they all did a great job. Sokratis were busier than in September since he was playing the lute now as well. As usual the guitar/violin duel between Brian and Hugh at the end of 'Bonny Swans' was great, Tal only adds to it. Then Brians solo for 'Beneath A Phrygian Sky' was great, as well as Hugh's solo for 'Huron 'Beltane' Fire Dance'. 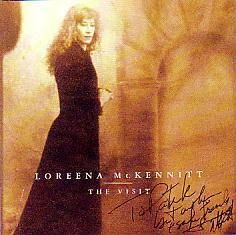 After the show, me and my cousins met Loreena for a while but there were many people there that wanted to meet her. 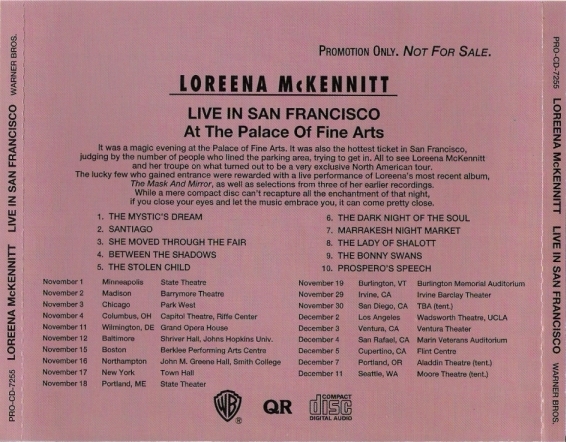 There were even three from Tokyo, Japan that were in Europe just for the Loreena shows in Copenhagen and London. 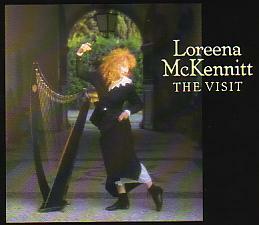 new harp, and Loreena was amazed to hear it, saying: "you have a very keen eye". And I do, especially for Loreena. to hear it, and gave him the best of luck, and said that she would love to hear the result. would leave it like this otherwise I just keep rambling the same words as ever, great, magnificent and so on.